The Bible describes nine separate end time wars. We have looked at the first two of these conflicts — The War of Extermination based on Psalm 83 and the First War of Gog-Magog based on Ezekiel 38-39. Both of these wars may very well happen just before or after the Rapture, but most likely sometime before the upcoming 7-year Tribulation. 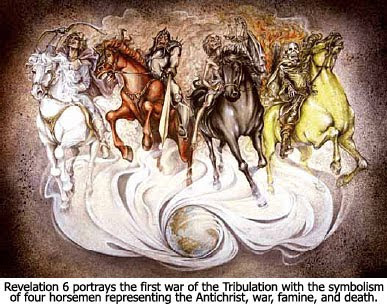 Now certainly into the Tribulation in the sequence of end time wars, we will look at the Conventional and the Nuclear Wars of the Tribulation. Although the Antichrist will rise to world power in Europe through cunning, deception, and intrigue (Daniel 8:23), he will have to resort to military power to conquer the world. Asia, Africa, and South America have spent too long casting off the shackles of European colonialism for them to suddenly surrender their sovereignty peacefully to a new European dictator — regardless of how brilliant and charismatic he may be. But the vast majority of all Muslims live outside the Middle East, the largest Muslim nations being Indonesia (201 million), India (144 million), Pakistan (140 million), and Bangladesh (115 million). These nations are the ones who are most likely to produce the strongest resistance to a Western, non-Muslim dictator, and they will be destroyed either in this war or the one that follows it. A hint that the conventional war will become a nuclear one is found in Revelation 8:7 where it states that the escalation of the war will result in one-third of the earth being burned up. Another hint is found in Revelation 16:2-11 where we are told that "loathsome and malignant" sores will afflict people at the end of the Tribulation, something that would be a natural consequence of radiation from the use of nuclear weapons. This war is portrayed in the book of Revelation in chapters 8-9 as a series of "Trumpet Judgments." In the fourth installment of this "End Time Wars" series, we will look at the fifth and sixth wars in the end times sequence — both the War in the Heavens and the War Against the Jews and the Saints. With all these wars going on how will Israel have a period of peace and security? How would it be possible to rebuild the Temple with a world wide warring conflict occuring? When will there be time to mark everyone with the mark of the beast if nuclear war is going on? I guess it's hard to sort out all these events with out some sort of visual timeline. Nathan, do you know of how/where I can view an accurate timeline of end times events? Israel's peace and security will be in place before the Trib. period. Their Muslim neighbors will be virtually wiped out, and how do we know that brokering a peace deal (not necessarily the covenant with Israel at that time) isn't how AC gets launched into power? their safety and allowing them to rebuild their temple. They will have 3.5 years to enjoy this false peace while AC goes about conquering the rest of the world. I think there is a lot of time for the mark and the other acts aside from war because especially if they are nuclear the actual battles will be over in days not years. Billy, I've posted a projected timeline at the bottom of the last Gog-Magog article. That what you're looking for? god knows perfectly well how secular the world is these days and what would be the point of vague judgments like nuclear war? why should people think god is doing this? i forgot to mention that if people received boils from radiation, why would they blame god? Good to hear from you, Hartdawg! I was starting to think you gave up on us. I was actually thinking about you today, buddy! Glen, I have long thought that the mountain that falls into the sea is a meteorite or asteroid. Up until a few years ago, NASA and the USAF never really considered a near earth object (NEO) as a threat because they didn't know they were there! Now, we're working on ways to deflect or destroy one. Is it coincidence that now, at the end of days, this is very real threat? Russia would fall/change it govt. There will be a world economic crisis with extreme debt and inflation. Food will become extremely expensive. The US govt will fall/change form of government. Genetically engineered diseases will destroy over half the world's population. It will mainly be a eugenic war. Book is titled A Dragon This Way Comes and it has been out there for over 3 years now. Thunder, I thought about that as well.....I googled "wormwood" one day and came across a site, out of austrailia I believe, it is a project called "wormwood project" that purpose is to find ways to deflect or distroy an NEO that might threaten us oneday. :-/ I thought it was interesting that they would name it "the wormwood project". It is interesting that it would be called "Project Wormwood", but I think someone in the naming process had a rudimentary knowledge of Revelation and thought it was a clever name. But, you never know. That could be God giving us a clue. tuff to say for certain. bottom line is millions will die!